H.I.T. stands for Homicide Investigation Team. The premise of the drama is similar to C.S.I. For more in-depth description of the drama and its characters, please click here. 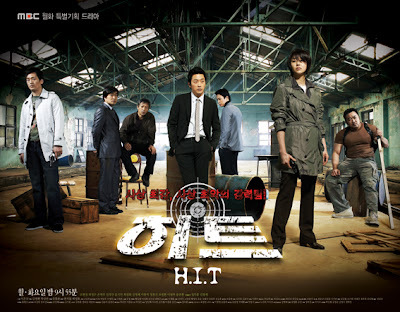 Currently, there’s no fansubbing group for H.I.T. because this type of professional drama can be quite difficult to translate due to its terminology and jargon. Although I will not be comprehending much, I’ll still be watching H.I.T. because I like this genre and I want to see how it compares to C.S.I. Also, I like Go Hyun Jung because she was very endearing in What’s Up, Fox? so I’m interested in her new project. Foxy Lady is the drama that follows Over The Rainbow in this broadcasting time slot. Its first episode is scheduled to air on September 20, Wednesday (Script writer: Kim Do-woo, Producer: Kwon Suk-jang). The story is about a not-so-bright older girl who dreams of a “fantasy love” and her relationship with her friend’s brother who is nine years younger than her. The drama stars Ko Hyun-jung and Chun Jung-myung as the odd couple with such a huge age gap. Ko Hyun-jung stars as Ko Byung-hee, a girl with the heart of a 24-year-old who is actually 33 and working as a reporter in a third-rate magazine company. She frequently finds it hard to cope with the blandness of her life. What she dreams of is working for a company that she can be proud of and finding a man who can provide warm support when she needs it. In addition, she wants to go on a world tour in a camping car with her new love. Suddenly, she gets into an accident with her friend Seung-hye’s brother, Chul-su (Seung-hye and Chul-su are played by Ahn Sun-young and Chun Jung-myung, respectively). Chun Jung-myung stars as Park Chul-su, a 24-year-old male working as a mechanic at a car repair shop. Chun makes his first appearance on an MBC drama with this show. Although Chul-su does not have much in life, he is filled with ambition and enjoys life by doing the things he loves: working as a mechanic and traveling. How many people actually find the love they dream of? Until they realize that true love is just around the corner, this couple continues to pursue this unique romantic relationship of “dating a friend’s brother” and “dating my sister’s friend”. Foxy Lady is written by Kim Do-woo who also penned the wildly popular My Lovely Sam-soon. Producer Kwon Suk-jang, who has created such fun-loving dramas for women such as Lady Next Door and Marry Me is in charge of the production. doozy: I’m really looking forward to watching this new show since I like Chun Jung Myung and the script is written by the writer of My Name is Kim Sam Soon.